These are the Armies of The Night. It’s sometimes hard to understand the cult phenomenon. What makes a movie seemingly go unnoticed upon first release and over time turn into a smashing success? 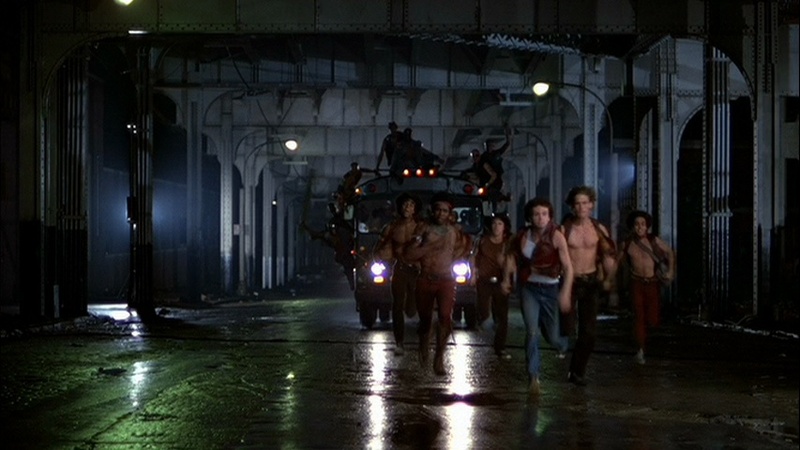 I couldn’t shake this thought out of my head as I was reliving for, I don’t know, maybe the fifth time The Warriors, one of the most widely recognized cult films ever. Directed by Walter Hill (famous for his work as a producer in Aliens), it was a mild success when it found its way to theaters in 1979 and critics probably didn’t help either with their accusations of banal dialogue and a plot that drags. Maybe they didn’t realize this was a movie about street gangs and surely they can’t speak that eloquently. 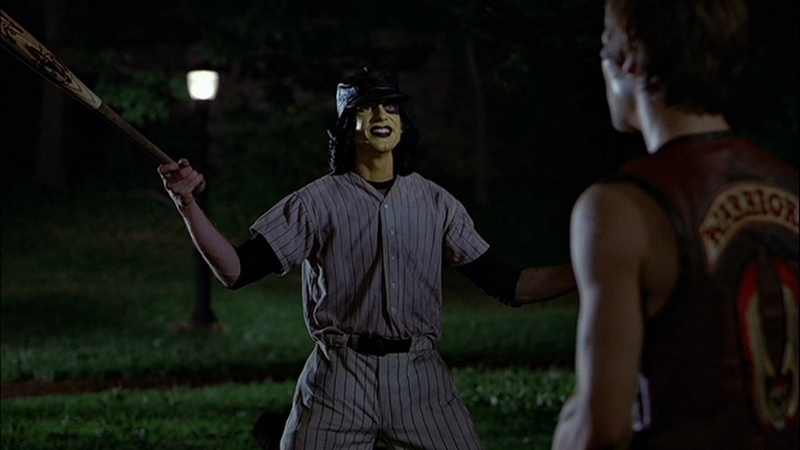 As for the plot that drags, I’ve given this some hard thinking and I couldn’t come up with any movie before The Warriors that deals with the “one night incidents” type of plot where any potential storyline is secondary. I’m referring of course to those movies that take place within one night, preferably in a big city, and the protagonist(s) have to meet with all kinds of unfavorable and surreal encounters until dawn. There have been many movies like this, especially Martin Scorsese’s After Hours which was ironically very well received by critics, but not before The Warrior it seems. Which brings me to my initial point: some movies are simply way ahead of their times and it takes many years until they’re fully understood. 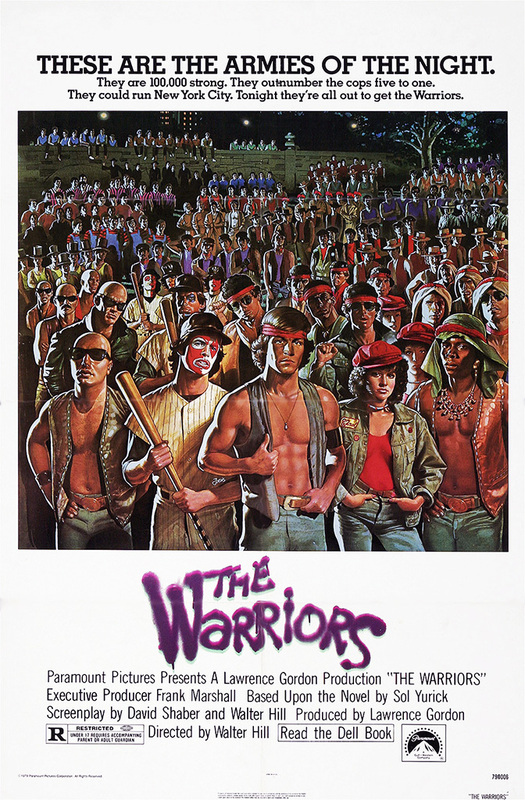 With its comic urban-nightmare style, over the top characters and mindless plot, I’m sure this is definitely the case with The Warriors. 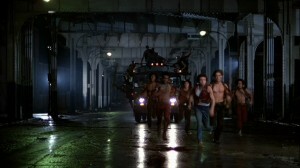 In fact, I feel like this film was a template for the 80’s B-movie scene — and there can’t be nothing wrong about that! The movie itself deals with a massive gang meeting in the Bronx organized by Cyrus (Roger Hill), the leader of the largest and most powerful gang in New York City, the Gramercy Riffs. Cyrus poses himself as some kind of prophet pushing for a permanent truce between gangs that would allow them to rule the nights. 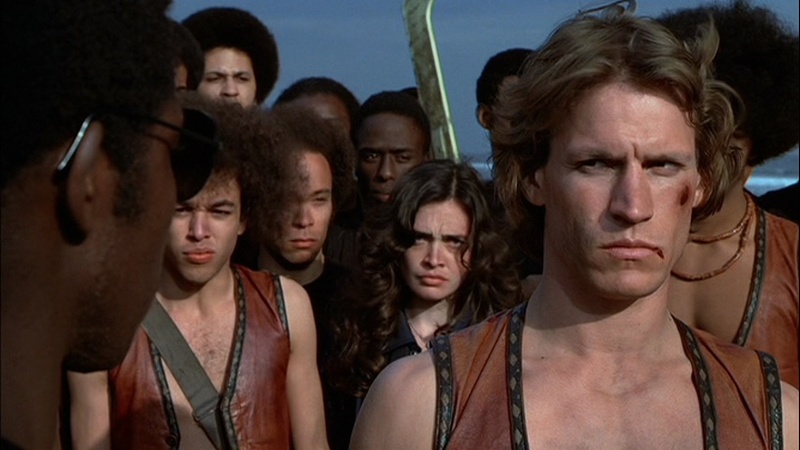 All of the most important gangs are invited unarmed to this meeting including the Warriors, who are lead by Swan (Michael Beck, who had a very promising career that went downhill after 1980’s Xanadu… but that’s another story). However, the meeting goes awfully wrong when a pretty lowly gang, The Rogues, smuggles a gun and shoots Cyrus. To make matters worse, their deranged leader Luther (David Patrick Kelly who you might recognize from Dreamscape, Commando and many others) blames a member of the Warriors and all Hell ensues. 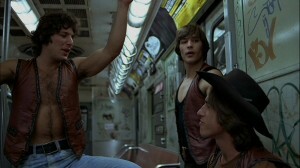 The entire gangs will be after the Warriors who must fight their way back to Coney Island, a pretty long way I reckon. What follows next is nonstop action, weird characters, disco music and a nearly apocalyptic urban landscape that any cult movie buff is surely to enjoy. 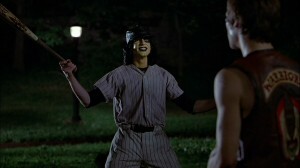 Each gang the Warriors encounter have a distinct style (ie: the Baseball Furies are like crazed baseball fans with their faces uniquely painted Kiss-style and carrying bats) and as pointed earlier they’re very reminiscent of comics. There’s a lot going on here and yet, you can’t help feeling like there was room for much more, especially even more oddball gangs. The performances in The Warriors deserve a very special mention too. First and foremost is the groundbreaking and classic speech by Cyrus which is powerful and hypnotic. 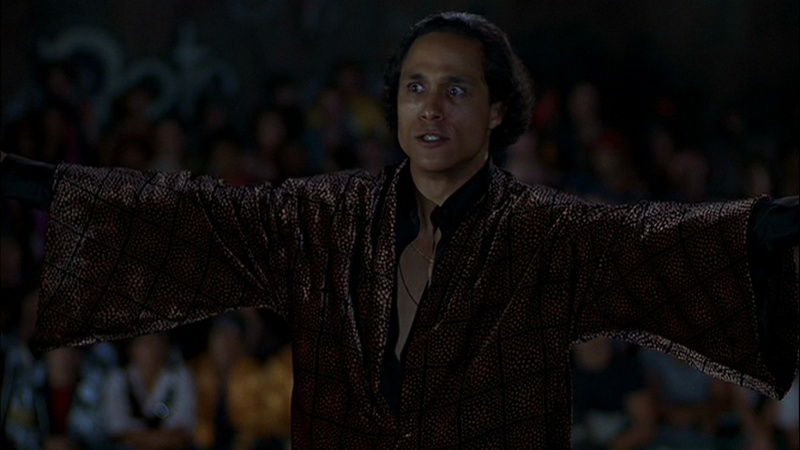 Roger Hill remains nowhere to be seen after this movie so he has turned into a kind of legend, not to mention his ultra-quotable line “Can you dig it?” has been referenced hundreds of times by now. All the Warriors are terrific as well. Unfortunately, as it was the case with Michael Beck, none of them had successful movie careers and many even stopped working after this, with the exception of Jamer Remar that is (Ajax) who I’m sure you will recognize from many films and TV shows, and most recently as the deceased father of Dexter who pops up from nowhere a la Obi Wan. 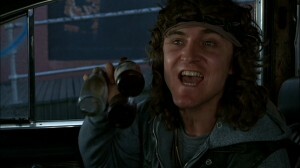 Last but not least is David Patrick Kelly who is as funny as he can be scary. He delivers his most famous line “Warriors, come out and play-yay!” in one of the all-time greatest movie scenes ever — and I’m not saying that lightly. It’s easy to dismiss The Warriors if you don’t approach the movie with the right mindset. I’ve always found it to be very imaginative and entertaining, and it’s also perfectly executed. The way the introduction builds up to Cyrus’ impressive speech for instance, presenting the leader as some sort of divine figure, is particularly effective. The entire movie works great and the only possible criticism within its context is that the ending feels rather anticlimactic. I’ve also mentioned that the story is secondary here and maybe to an extreme: we’re never told why Cyrus is killed, even though we’re hinted at foul play by a mysterious benefactor of The Rogues. Still, these are minor complaints in the whole picture – they would have been major setbacks in many films but not here. 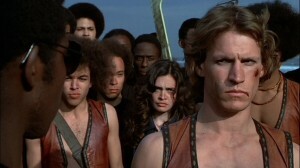 The Warriors is an absolute classic and the true definition of what makes a cult movie. 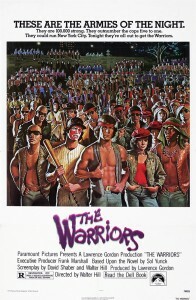 The Warriors can be acquired from Paramount Pictures. I saw this late one night on Joe Bob Briggs USA show (?) and he pointed out that the plot was Xenophon’s “March to the Sea”. This event occurred before Alexander the Great’s expedition and the names like Cyrus are based on this event, sort of how “Oh Brother Where Art Thou” is based on the Odyssey. I got to here via Al Lowe’s CJ.3k Al is a great guy. Actually, there’s a narrated introduction that likens what happens in the movie to a Greek battle in the Director’s Cut (on DVD), but I didn’t know that it was lifted straight from a Greek legend. Cool info, thanks for sharing! Al was really nice to post the link to the blog. He’s one of the kindest game designers around for sure (and I hate what they did to him with Sam Suede).